Didn't blog last week, nothing much to show as had been making hearts for Luv Shack and only had a pile of hearts and an idea of what I wanted to do as had found a free pattern online for a small wallhanging designed by Jane Spolar and I really liked the heart shape and the simple design. Discovered that by cutting carefully and reusing the cutout shapes on a second base I could make the hearts in both positive and negative making for less waste though both hearts had to face the same direction. With my red fabric selection made plus a few others it was time to play on my background. Playing with placement of my red hearts. Decided to leave out the swirly bits and just use the "stems" and flowers as my accent .Although I had laid out more hearts I needed to fuse and stitch what I was happy with. Happy so far, the gaps will continue placing hearts of this size and then look at filling the gaps with smaller hearts of varying sizes and shades. Work stopped last Tuesday afternoon when Esther released block 3 of Diamond Hill. had been looking forward to the one with the big leaves and hooray it was that one. In the pattern it sits diagonally opposite block one so I knew what fabrics I wanted to use but my block 2 was bolder so needed to get the balance right with this one. Made my big leaves first and made the mistake of not putting it on my wall and standing back and taking a good look before diving in and stitching my bright green. There was no problem with the bright green but my darker green was too dark and was hard to see against the background. Changed the top of the leaf to the mid green which helped but didn't fix it completely so searched through my threads to find a brighter green thread that was still in the right colour family. It helped although still wish I had used the mid green. Another issue at this point was running out of my lime green Batik, enough for D Hill but had also used it on my Luv Shack and not enough for both. LQS had one that looked identical so decided to keep what was left for LS and use the new one for the rest of D Hill. Look closely and you can see that the smaller leaves are a different shade and so is the thread as was running out of that as well. The changes look fine though so got away with it. Used double blanket stitch for the leaves and single for the stems which has given more prominence to the leaves. First flower is the same orange fabric as block 1 but with double blanket stitch. With all my double blanket stitch I am using a heavy tearaway under my stitching and removing afterwards to prevent any puckering. Pink flower is again same fabric as block 1 but used a variegated pink for my stitching and love the effect it has given. But the lavender flower was a disappointment at this stage. Thread matches fabric too closely and the stitches created a whirling look around the flower, felt dizzy looking at it. Searched through all my threads and tucked away in a sample box found a 12wt egyptian cotton in very soft variegated lavender so stitched my other flower with that and it was so much better. Being thicker I only used single blanket stitch. Happy with the result I restitched my first flower. Amazing what a difference the thread can make. Finished apart from the vase and non of the issues making it matter any more. 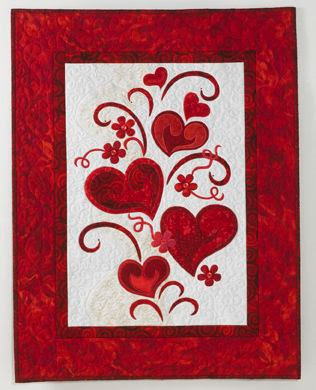 Today its back to making some more hearts for my friends quilt so am linking now with Esther's WOW and heading back to my sewing room. What a pretty design your heart block is - looking good!! Beautiful Diamond Hill block. The hearts are lovely too. Great job on both projects. Hi Jenny - Your Diamond Hill is looking good - I am being tempted to start this one now that block 3 has been released.